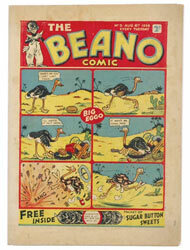 Big Eggo hatched a big surprise when his second issue Beano made over two thousand pounds in our sell-out March auction. 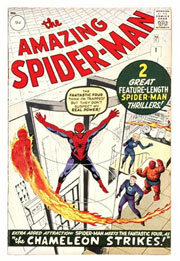 As most of our collectors know, second issues of comics are often much rarer than first issues, which were often over produced to take advantage of pre-launch publicity and every selling opportunity. 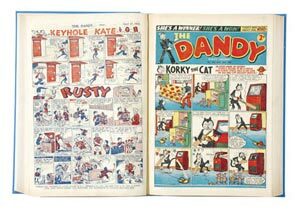 Even in the late thirties, the canny folk at DC Thomson had produced mini-comic flyers for the impending publication of Beano and Dandy to be inserted in their current "Big Five" weeklies of Adventure, Hotspur, Rover, Skipper and Wizard. The flyers, themselves can easily top £100 at auction when ever they appear. 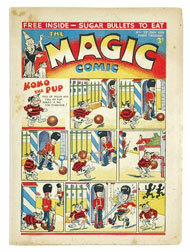 Magic comics are also rare, having been the third sibling in the Beano/Dandy stable and a victim of wartime paper shortages after eighty issues in 1941. Rare though it is, the title and its characters are less well known and issues do not fetch as much although just short of £2000 for the Magic No 1 is the second highest price ever achieved. 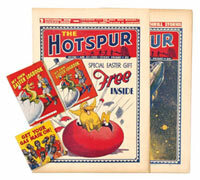 This wonderful complete Hotspur year had all its fourteen booklet free gifts with colour covers by Dudley Watkins and he even managed to make the chillingly titled "Get Your Gas Mask On" seem like a schoolboy wheeze to outwit the dreaded Hun! The successful bidder paid £440 for this very high grade set. 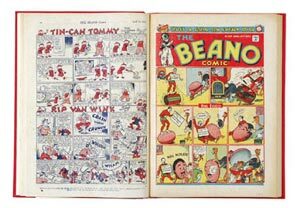 This Beano propaganda war year complete in its bound volume exceeded all expectations with a winning bid of £935.00, the highest price ever achieved for a bound volume from the 1940s, especially when considering that due to wartime economies the comic was printed fortnightly so 1943 only accounted for only twenty-six issues! In the same way the scarce Beano Book of 1942, annual number three, with light foxing and some finger-marked pages was strongly contested to £1,265 before winging its way to Yorkshire and its enthusiastic new owner. 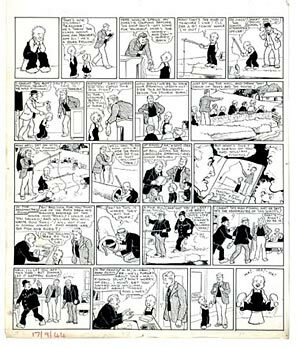 Oor Wullie continues to charm and entertain all who cross his path, except perhaps for his long sufferin' head teacher who discovers Wullie's fishing tackle by a NO FISHING! sign and is in turn caught by the local bobby in full possession of it. The head's embarrassment is certainly enough to get the Wee Lad's 500 lines cancelled! £1101.00 saw this wonderful Dudley Watkins piece return to Dundee from whence it came. 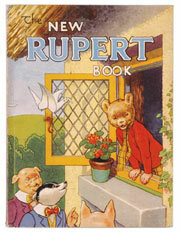 The Rupert annual from 1946 made £140 and the annual for a year later made £231.00; the difference between Fine and Very Fine grades accounting for nearly one hundred pounds difference in the winning bids. We don't always see strong prices for rare items, and such was the case with our Rupert annual No 1 from 1936 with some pieces missing from its split dust-jacket. We had offered the lot with a £900-1200 estimate and finally sold this relatively scarce piece with original Daily Express mail folder for £800, its eventual purchaser happy to put it away for a couple of years with a view to restoring its well worn dust-jacket in due course. Dandys from the mid 50s used to be readily available for a fiver each or less but collecting habits are changing and bound volumes, once shunned, are much more popular these days as they allow enthusiastic panelologists to move their fun-filled hobby from the attic floor to the living room bookshelf. Also the binding restricts ongoing colour and page fading whilst increasing longevity. 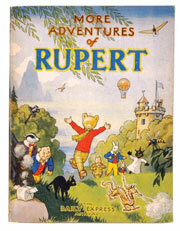 The 1954 example illustrated above saw bidding equate to £8.50 a copy. 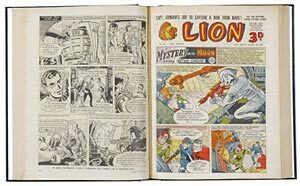 In the same way, Amagamated Press's Eagle clone, Lion has doubled in value over the last few years and this fresh 1956 full year in two bound volumes made £222. Highlights from our U S section included some of legendary artist Frank Frazetta's exciting Buck Rogers covers for Famous Funnies and these three fresh mid-grade examples were bid to £130, £193, and £141 respectively. 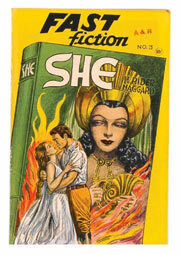 Fast Fiction # 3 featured the wonderfully evocative H Rider Haggard "She" cover which was bid to £88.00, but the star of the stateside show was a well preserved, bright faced young Spider-Man who, in pence-priced Fine Plus format reached a web-slinging £1100. Aunt May would be so proud. Prices Realised for all the lots are in that section and our next catalogue is in May/June 2005. I hope we'll see you then.